And you can find higher estimates of the death toll than that. The position of the British government is pusillanimous. Naturally, a government is not a judicial body such as can deliver a legally authoritative verdict. But that is no reason for governments not to declare a view where there is abundant evidence for it. The other morning, I escaped unscathed from a dangerous situation. No, an armed robber didn't break into my house, nor did I find myself face to face with a mountain lion during my bird walk. What I survived was my daily shower. You see, falls are a common cause of death in older people like me. (I'm 75.) Among my wife's and my circle of close friends over the age of 70, one became crippled for life, one broke a shoulder and one broke a leg in falls on the sidewalk. One fell down the stairs, and another may not survive a recent fall. "Really!" you may object. "What's my risk of falling in the shower? One in a thousand?" My answer: Perhaps, but that's not nearly good enough. Life expectancy for a healthy American man of my age is about 90. (That's not to be confused with American male life expectancy at birth, only about 78.) If I'm to achieve my statistical quota of 15 more years of life, that means about 15 times 365, or 5,475, more showers. But if I were so careless that my risk of slipping in the shower each time were as high as 1 in 1,000, I'd die or become crippled about five times before reaching my life expectancy. I have to reduce my risk of shower accidents to much, much less than 1 in 5,475. This calculation illustrates the biggest single lesson that I've learned from 50 years of field work on the island of New Guinea: the importance of being attentive to hazards that carry a low risk each time but are encountered frequently. Fathom is 'a new quarterly journal of expert analysis, informed opinion and genuine debate about Israel and the region'. Its editor is Alan Johnson, Senior Research Fellow at BICOM, and its team of advisory editors includes Paul Berman, Martin Bright, Anthony Julius, Anita Shapira and Michael Walzer. The inaugural issue of Fathom has already appeared, and the second is due next month. The talk I presented in May of last year to the YIVO conference on 'Jews and the Left' will appear in that second issue and is now posted on the Fathom website as a preview. My mate Gerald is known to be a rough and boisterous bloke. When you meet him in the street, he'll shout out his greeting for all around to hear and, as likely as not, give you a hefty slap on the back and a hug that can leave you shaken. Have him over for a meal and he's the proverbial life and soul, full of noisy jokes and colourful anecdotes, laughing and generally filling the air with sound. Gerald's friends enjoy his company, and even people just making his acquaintance mostly do as well. The occasion on which a few of his friends accompanied him to a piano recital at the Royal Festival Hall, however, I didn't enjoy one bit. I didn't enjoy it because Gerald behaved (let us just say) in character, so causing more than one disturbance during the concert, embarrassing us, and annoying both the pianist and many people in the audience. End of story. Let's, now, forget about whether Gerald Scarfe - not the same guy at all - has anything whatever against Jews; and let's also forget about whether his recent cartoon was ill-timed for coinciding with Holocaust Memorial Day. Unless there was something wrong with it as a cartoon, there could be no reason to think it was ill-timed. So let's focus instead on whether or not the cartoon was ill-judged. As to Scarfe's cartoon specifically, it seems to me almost identical to every other blood-spattered pictorial lament for man's inhumanity to man he's knocked out over the past 40 years. Except in this case, because of the subject matter and the timing – on Holocaust memorial day – the trademark Scarfean gore could, if you chose, have wider ramifications. And so it has proved. But this is not just about what one might 'choose', as it were wilfully falling into misunderstanding. A standard form of traditional Judeophobia has been the blood libel, and so a cartoon like this one of Scarfe's invites misunderstanding. As with the other Gerald I began with, whose loud behaviour was wrong at the piano recital though acceptable and accepted in most other contexts, it doesn't matter that Scarfe's blood-filled cartoons are usually OK. Just so, a cartoonist might have spent her life depicting white politicians as monkeys, but if she drew one of Nelson Mandela or Robert Mugabe in that vein she would be inviting misunderstanding and the charge that her cartoon was racist. 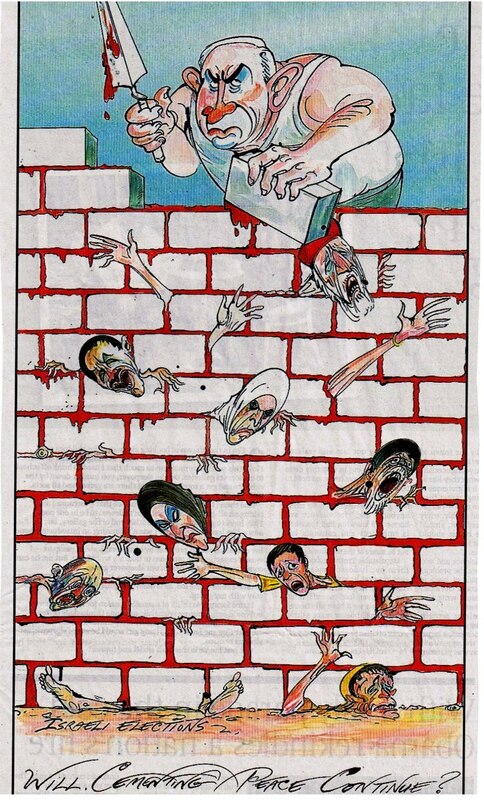 Whatever else one might think about Scarfe's depiction of Netanyahu, I'd say it was ill-judged, despite the former's predilections as a cartoonist. It's only days since Jonathan (Mugabe-isn't-all-bad) Steele was telling us of the good news from Zimbabwe. Now, according to the country's Finance Minister Tendai Biti, the government has only $217 left in in the bank. Gosh, $217; that isn't much. Especially not for a government. And the lack of ruboolas is getting in the way of voter registration. In three earlier posts at normblog, Eamonn McDonagh reported on allegations that the government of Argentina was holding secret talks with Iran aimed at brushing the AMIA massacre under the carpet and finding a formula to allow normal relations to be resumed between the two countries, relations that had become slightly strained because of Argentina's half-hearted attempts to have those suspected of responsibility for the mass murder of Argentine citizens extradited from the Islamic Republic. On Sunday a barrage of tweets and a note on Facebook from President Cristina Fernández de Kirchner confirmed that the allegations made in 2011 were essentially correct. She announced the setting up of a joint Argentine-Iranian commission comprised of jurists from both nations (and with the participation of some others from third countries) to 'examine the documents presented' by Argentina and Iran. The proceedings of the Commission are to be held in Tehran, naturally. The document also states that the Argentine court that is seeking the extradition of the Iranian fugitives will be able to question the suspects in Tehran. It's not clear how this is supposed to fit in with the workings of the Commission and readers of this blog will need no reminding of the intrinsically grotesque nature of the proposal. The Commission is supposed to draw up a report which the parties bind themselves to 'take into account'. The agreement represents a quite astonishing cession of sovereignty by the government of Argentina. It has effectively turned its back on the work of its own courts and invited the nation that has protected from extradition those suspected of murdering dozens of Argentine citizens to stand in judgment on the work of its legal system. The reaction in the Iranian state media indicates that the regime there sees the agreement as involving Argentina's abandonment of its extradition request, indeed of its abandonment of any accusation of Iranian involvement and its commitment to jointly investigate the murders with Tehran ab initio. No doubt the Iranian authorities will use the hearings to further ventilate their well-known views on who really runs the world. To grasp the nature of what has been agreed readers may wish to imagine the United States setting up a joint commission with the Taliban to investigate the 9/11 attacks, with all its work to be carried out under Taliban supervision in Kabul. The man chiefly responsible for negotiating this agreement is Héctor Timerman, Argentina's Foreign Minister. Since its announcement one of his principal occupations has been to condemn Israel for criticizing it. Israel, he says, should respect Argentina's sovereignty. Timerman is Jewish, as are some other prominent members and supporters of the government. In the minds of some, this means that no question of anti-Semitism can arise with regard to its dealings with Iran. Other interpretations of their role are possible. The government of Argentina has prosecuted and jailed some of those responsible for the deaths of Jewish Argentines (among many others) during the 1976-1983 military dictatorship and it was right to do so. Their murders can be inscribed in the discourse of a failed national revolutionary process that the present administration likes to recall as heroic. By contrast, those Jewish Argentines who died in the explosion that took place at the AMIA community center in Buenos Aires on the morning of July 18th 1994 were murdered for the sole and only reason of their Jewishness and, therefore, in the eyes of the government of President Cristina Fernández de Kirchner, they constitute no more than an impediment to improving relations with Iran and to an opportunity to give life to certain fantasies about Argentina's leading role in world affairs. You can find the names of the dead here. Accepting what my parents and teachers say. Thinking hard about the probable consequences of actions and their effects on other people. Reading a holy book or listening to a religious leader. I don't really think about it much. People should just do as they like. From these options I could only take the second. But it's incomplete: consequences shouldn't be the whole story, as I've argued here. How much of a humanist are you? Some people think that too much attention has been given to the Holocaust. Me, I'm with Angela Merkel when she asserts, 'We must clearly say, to generation after generation, and say it again: with courage, each individual can help ensure that racism and anti-Semitism have no chance'. For nearly 70 years, Harry Grenville and his sister Hannah, who were Jewish refugees, wondered what dreadful fate had befallen the parents they had to leave behind in Nazi Germany. The siblings were evacuated on one of the last Kindertransports allowed to leave the country before the outbreak of the Second World War. They came to England, where they found a home with a foster family in Cornwall. After the war, they tried without success to discover what had become of their parents but every record had been destroyed. Then last week, out of the blue, came the confirmation that the pair had been seeking all their lives. A Polish visitor to the Auschwitz museum photographed a vast pile of suitcases left by victims murdered in the Holocaust. Each had a name and serial number painted in white letters on the front. The visitor decided to try to trace surviving relatives - and tracked down Mr Grenville, 87, to Dorchester, Dorset. Mr Grenville and his sister were among more than 10,000 Jewish children allowed to leave Germany before the war. After their departure, their parents and grandmother were sent to an internment camp. During the early years of the war the children received brief messages from their parents relayed by the Red Cross. In 1944, a final message informed them that their parents were being moved to another camp further "east". Mr Grenville now knows their final destination. By March 1944 the ghetto population had fallen to just 300 people and it was closed. Those who remained were marched to the railway station and, on packed "cattle trucks", taken to Majdanek, near Lublin, Bryer's first concentration camp. After being ordered to strip and stand naked in the snow, she and the others were given "a striped uniform, a striped dress and a white handkerchief on the head - and that was all you had in this winter". She spent her 17th birthday in the camp. After six weeks the family were moved again, with Bryer sent to Plaszow, near Krakow - the concentration camp portrayed in Schindler's List. Life there was brutal, with the prisoners divided into work teams and forced to push wagons full of stones, laden from the quarry. "It was a hell of a job, we could hardly manage. There were shootings and hangings and there was no crematorium there - only a hill where they used to burn the people and all the ashes used to fly over us." Another danger was the demand for blood for German troops fighting in Russia, which was forcibly taken and difficult to recover from. It was at Plaszow that her father, an "upright" man who no longer knew where his wife or children were, was beaten to death by a guard. "On April 18th, 1944... there was a knock on the door. They said, 'Pack up your possessions, tomorrow we're coming to pick you up,'" said Edita, her voice quavering with emotion. "We said, 'but where are we going?' They said, 'it's nothing, it's a work camp.' So we thought we were going off to work and were waiting outside the house the next morning," she continued. "They took us to the Pushkin synagogue. You can't imagine the scenes there - people crying, shouting, children, the sick - all crammed into the synagogue. We survived the night, and the next day, Sunday morning, we were marched down to the brick factory." Kosice's brick factory had been transformed into a concentration camp for 14,000 Jews from the city and surrounding villages. From there Edita, her sister, parents and several relatives were loaded onto cattle wagons bound for Auschwitz. Josefa Gottlieber was 27 when she died in Auschwitz. This is all I know about her. Every year for the rest of my life on Holocaust Memorial Day... I will light a candle in her memory. Another thing that's had its day is the political outlook defended in this article by Alex Callinicos. Disavowing 'the mindless repetition of a few sacred formulas', urging the need, instead, for 'continuous creative renewal', Callinicos remains attached to the Leninist model of organization and he's out to defend it. I will spare readers having to read substantial excerpts from his article (just follow the link if you have the resilience), but creative renewal evidently doesn't extend to wondering if the Leninist model might have had some limitations - limitations that could have contributed their part to what Callinicos identifies as the degeneration of the Russian revolution into Stalinist dictatorship. Might I suggest two such? They are inter-related within the conception, as he himself coyly puts this, of 'what is sometimes called a "vanguard party"'. The notion of a vanguard party is a monopolistic one both politically and intellectually. In being so, it is incompatible with any genuine principle of democracy, including socialist democracy. It is implicitly monopolistic in a political sense because the vanguard party is supposed to represent the interests of the working class in face of the uneven experiences and fragmented consciousness of real workers; as if there were a unified interest here and as if one organization could have a unique claim to having hit upon it. And it is implicitly monopolistic in an intellectual sense because the ability of this vanguard organization to fulfil its role as vanguard is supposed to be based on its 'shared Marxist understanding of the world'; as if Marxism, or any other single doctrine, theory or approach to grasping social and political matters, could measure up on its own to the small task of understanding the world. Chris is saying that, for him, 'socialism... is not about hippy-dippy all-you-need-is love idealism'. I agree - because love isn't all you need and, anyway, universal love isn't a sensible expectation. I argued for this view at length in the series I recently posted about Jerry Cohen and the camping trip. Here, I want to set out, briefly, argument for the proposition that utopian ideas about human nature aren't just unnecessary for socialism, they're inimical to it. (a) As conceived by socialists, socialism will be a desirable state of affairs, in which the most basic oppressions known to humankind have been eliminated so far as possible or else curbed, alleviated. (c) Supposing either that human beings are completely benign or that they can be made so by changing human nature to remove everything bad from it weakens the chances of the requirements just stated under (b) from being included in the thinking, the programmes and the policies of socialist organizations and movements. It thereby increases the chances of repeated moral and political failures such as we know enough about already. (d) Evidence that human beings need, if they are to live well together in large numbers, restraints of the kind stated in (b) is overwhelming - pending someone somewhere coming up with something new in the way of relevant evidence. (e) Utopian ideas about human nature that ignore this evidence are a political folly that has been far too costly in human life and human misery. (f) A socialism that relies on wholly, or mostly, benign assumptions about human nature has, consequently, had its day.